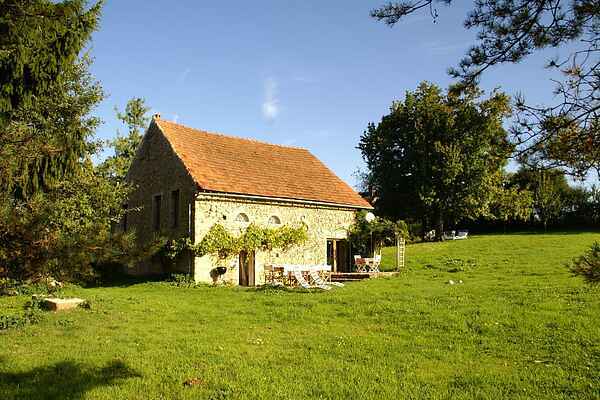 Tastefully renovated, characteristic barn in picturesque Montigny, solitary situated on a hill with fantastic views. Next to the holiday home is a terrace with garden furniture and a barbecue. Life is good here. Add a fine Burgundy, ready to drink with it, heavenly! You also posses a grass garden around ‘your’ house. You will find fruit trees in the garden, including a cherry tree with a swing. In Quarré-les-Tombes (7km) you will discover the market with its local produce. You will also find a supermarket, a bakery, an outdoor café and a restaurant there. Montigny is located 3 km from St. Germain-des-Champs on the edge of the Morvan. This is a beautiful unspoilt nature sanctuary with plenty of rock and water features and clad with a lot of greenery. It beckons to be rediscovered again every day, over and over. Not in the least because of the numerous swimming lakes that it houses, such as the Lac de Crescent just a mere 2km away. You will find a grassy beach, shady trees and picnic tables here. Sufficient ingredients for a couple of beautiful days out. There is plenty to do in the area. Too much to mention actually. We will mention canoeing, cave dwelling and castles (e.g. near Bazoches, 19 km) or a stroll through the streets of Vézelay (20km) with its grandiose basilica of St. Madelaine. Madelaine.